We are passionate about staircase design, and we believe you can see this in every project we create. We put our years of experience of design and installation into creating the ideal staircase solution for your property every time. We provide the complete staircase service from consultation through to design, construction and installation. During the consultation process, we will take time to ensure we create bespoke staircases that accentuate the existing design features of your property. If you have a particular idea in mind, we can advise the most practical way to install your staircase and let you know of any potential issues or conflicts with existing furniture and architectural features. We create metal and glass staircases in many different styles and designs including spiral staircases and floating stairs. Depending on the style of your property and your existing décor and furniture we can advise you on the best staircase design for practical or aesthetic purposes. If space is an issue, we can create solutions that maximise your available space without making your property feeling too cramped. 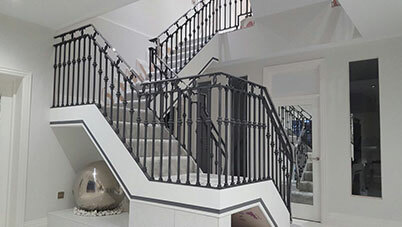 Creating stunning staircase designs that are eye-catching, central focal points for your property are our speciality, but if you require something a little more subtle yet still functional, we can also create bespoke staircases that coordinate with your property. Whatever you have in mind, whether it be grandiose or understated, don’t hesitate to let us know and we will factor this into your design brief while taking into account your budget requirements and available space. 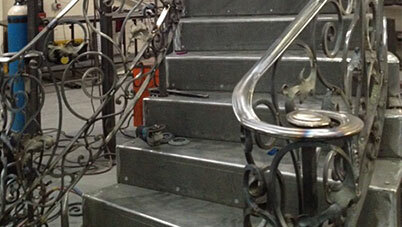 We have created staircases for a variety of customers both commercial & domestic. Check out some of our staircase designs in our Portfolio to get an impression of what we can create and install. If you would like to know more about our design process, the materials we use or any other questions relating to staircase design, please Get in Touch to discuss your requirements today.